Dr. Jared Vagy DPT shows you how to modify your finger strengthening exercises to improve their rock climbing specificity. The forearm and fingers contain two types of major muscle groups: flexors on the palm side, and extensors on the back side. In addition, each finger contains flexor tendon pulleys (5 annular ligaments (A1–5) and 3 cruciate ligaments (C1–3)) that act as ligamentous straps to keep the finger flexor tendons in close contact with the bone. 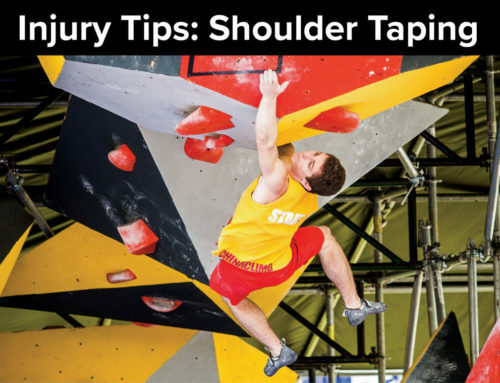 Climbing overdevelops the finger flexors and can lead to flexor tendon pulleys sprains. Click here to learn about how to diagnose a pulley sprain injury. In addition, the overdevelopment of the finger flexors can lead to weakness of the finger extensors, which help to stabilize the fingers while climbing. Given this imbalance, it’s important that you perform finger extensor strengthening exericses to prevent pulley sprains. This series of exercises strengthen the finger extensor muscles and tendons in the back of the hand, wrist and fingers. Perform isometric holds at varied angles to mirror the muscle actions of the fingers while climbing. Perform three sets of 30 seconds. However, your hold times during the 30 seconds will vary based on your preferred style of climbing—they should be roughly the same length of time you grip holds on the rock (see chart below). Place a rubber-band around the tips of your fingers while maintaining a straight wrist. Spread your fingers without bending your wrist. Hold this position, then let your fingers collapse back in. Use several rubber bands around your fingers to increase the resistance. You can find thick rubber bands in the vegetable section of the grocery market. They are usually wrapped around asparagus and broccoli. You can progress the exercise by using a resistive device such as the Metolius Grip Saver, Theraband Hand Xtrainer, and Powerfingers. Below are three great options that you can use to strengthen your fingers. To achieve the best results with isometric finger training, perform the exercises in positions that mirror common climbing grips. The images below provides an example of using a single rubber-band in an open-hand and half crimp position. Girth hitch rubber bands to a carabiner and pull the carabiner towards your elbow (a sling helps). This allows you to individually strengthen several fingers at one time in a climbing-specific finger position such as a half crimp. These tips are terrific. Just bought your Injury Prevention online course and already can feel some strengthening in core areas. I’m relatively new to climbing and older than most – so inexperience can make for strains and slower recovery. I sprained my pulley tendon and found Thera Putty in various densities to be an excellent rehap tool. Blue color when relaxing helps keep up conditioning. Looking forward to more of your insights! Thanks!